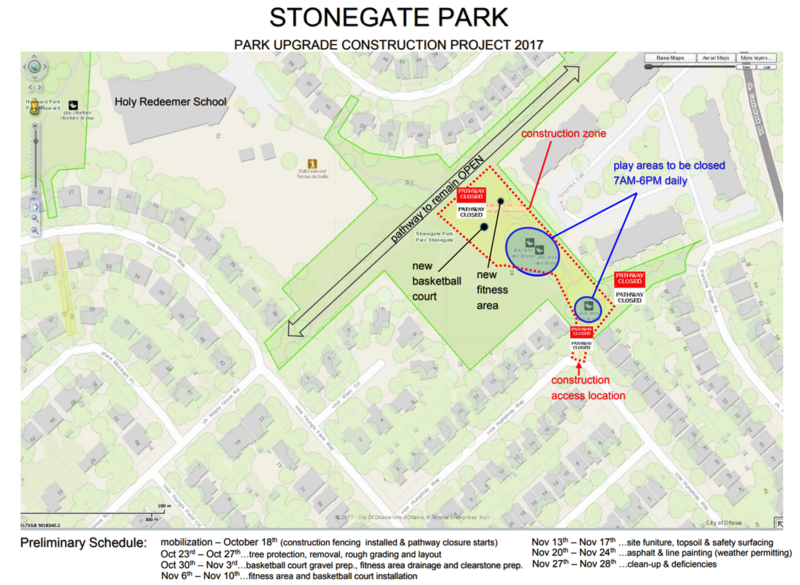 Stonegate park is currently undergoing some work to add new features to this park. A basketball court is being added along with a new Bamboo climbing garden, games table and new benches. This work began last week and is expected to be completed by the end of November (weather permitting). During the construction period, the play areas will be closed daily from 7am-6pm and the pathway into the park from Humphrey Way and Parsons Ridge will also be closed. The pathway between Young’s Farm Way and Castlefrank Road will remain open, however the cross through path from the park heading over towards Holy Redeemer school will also be closed. Thank you for your patience while this work is being done. A map showing the pathway closures and park plan can be found on my website. Notice to Residents: Please be advised of the below pathway closures at Stonegate Park starting October 19th 2017. Pick your project site, your cleanup date (rain date too! ), and time. Promote your project and gather your project team. Be sure to plan ahead for the proper disposal of compost, garbage, recycling, leaf-and-yard waste and any other hazardous items you may collect. Need assistance? Call 3-1-1. Cleaning the Capital is an ideal way for neighbours, family and friends to work together and clean up their neighbourhood. Fill out the online registration form or call 3-1-1 to register your project. If you need supplies, remember to request your project starter kit and to select your desired pickup location while registering. If you requested a starter kit, remember to pick it up. If you have questions about your starter kit pickup date, please call 3-1-1.You can find a complete list of pick up locations on the online registration form. Don’t forget to fill out your online cleanup report before the submission deadline for an opportunity to win more prizes. Spend your next coffee break with employees or co-workers picking up litter. If you or your employees smoke, remember to dispose of cigarette butts responsibly. Arrange for suitable ashtrays and sweep up cigarette butts. Contact us at cleaning@ottawa.ca(link sends e-mail) or 613-580-2424, ext.13458 to get Cleaning the Capital promotional materials to display in your store or office. Celebrate your success and gear up for the next event! A young boy named Christian Buck from the UK started the Buddy Bench initiative. Through social media and the Children’s Village monthly magazine subscription to Highlights Magazine. The teachers and kids fell upon an article, sharing Christian’s story. The children immediately began to advocate to get their own buddy benches for their play yard at their school, Bridlewood Community Elementary School. As a non-profit organization The Children’s Village of Ottawa-Carleton has been servicing children in our communities for 150 years. The children of CVAB have voiced how important it is to give back. Last year they donated their funds raised to other charities and this year they are not just giving back to themselves, but they are giving back to our community as well. ​CVAB’s Executive Director Deborah Thompson, plans on challenging other childcare centers, third party operators and schools to jump on board and do the same. We believe every play yard should have a buddy bench, every child deserves an environment that reduces loneliness, spreads kindness and fosters friendships!